If any of the attendances fails to reach 15 I will refund any contributions less credit card processing fees if applicable. to download the version for you phone. Now I do and see a lot of presentations using PowerPoint. I work really hard to make my presentations as engaging as possible and of late I have tried to really cut down the amount of information, especially bullet points, that I use. The issue largely isn’t that a presenter can’t use PowerPoint, the issue that PowerPoint may not be the best tool for the job. Most are also not graphic designers and need help making something that is eye catching. You need to think of Sway as something that doesn’t replace PowerPoint but is another tool in your arsenal that can be used for a wide variety of tasks quickly and easily as the video shows. This is where I think Sway will work for me. It is going to allow me to create a very engaging presentation very quickly and easily. Combine that with the fact that Sway is a web app and allows you to quickly share it on any device is another reason I think it will work well for presentations. It means I can share my Sway presentation with those in the room on their devices as I give the presentation, which again makes it far more engaging I believe. and download the app and start Sway-ing away. You’ll be surprised at what you create and how quickly you do it. I’ll share more experiences of Sway soon. I’m joined in this episode by Office 365 MVP Darrell Webster to discuss enterprise social in Office 365, specifically Yammer. Darrell let’s us know what Yammer is and how it can be used inside a business. We also cover off what are some major challenges facing Yammer adoptions in businesses large and small, including some strategies on how to overcome these. If you are yet to come to grips with Yammer then this is a great place to start learning from one of the experts. Of course, I’d love to hear what you think of this episode or any others. Also, if you are interested in being a guest on the show to discuss business or technical topics also feel free to contact me (director@ciaops.com). One of the technology ‘hobbies’ I enjoy is studying the impact of technology on crime. The above talk by Marc Goodman (A vision of crimes in the future) is very thought provoking and eye opening. I am constantly amazed at how lax so many people are when it comes to their security. I am constantly stunned by how casual and naive people are when it comes to using technology. Most violate the most common security practices without any thought in the desire for convenience. They do things they would never accept in the physical world, yet on line, for some reason common sense abandons them. This the world we all live in, today. Right now! My opinion, is we are making the world much more vulnerable. We are allowing a single ‘Black Swan event’ that could basically terminate the comfortable way we lead our lives today. Information and Bio technology are advancing at such a rapid pace and if you think they are only being used for good then you REALLY need to watch this video and become afraid of what is possible. The rules have changed. We are connecting a totally interconnected world where the failure or disruption of part can effectively bring down the rest of the system catastrophically. My advice? Take security seriously. Get involved. Get informed and always make the choice of security over convenience. This removes another hurdle that has previously prevented many businesses and resellers from going Office 365. Being hosted from local data centers in Sydney and Melbourne means the performance should be significantly better as we have already seen with the Australian Azure data centers. Apart from speed, another reason for not going Office 365 has been questions around data sovereignty but in today’s interconnected world this has becoming less and less of an issue because we all rely on emails which are unencrypted with guarantee of delivery right? However, for some, having their data hosted within their own country is now a reality with Office 365. I believe the adoption rates here in Australia off Office 365 will significantly jump for the above two reasons let alone all the other benefits this announcement brings. There now really aren’t a lot of reasons why a business, especially a small business, shouldn’t be considering utilising some aspect of Office 365. The move will also put pressure on local IT resellers to look more seriously at re-tooling their business model to be more focused on Office 365 as demand for the products rises. It is great to welcome Office 365 data centers to Australia and I look forward to all the benefits and opportunities they provide. Tas is back again for this episode to dive into everything Office 365. We especially look at some of the features of the advanced SharePoint Online plans and how these can benefit your business no matter how big or small. We also cover off a swag of Office 365 news and updates. Here’s an idea. What about Delve for the desktop to replace the current OneDrive for Business sync tool? Delve uses the Officegraph technology to analyse ‘signals’ from your Office 365 interactions. Things such as browsing SharePoint sites, viewing documents, editing documents, sending documents, sending emails, etc are all combined and surfaced via the Delve tab in Office 365 in a layout much like Flipboard. The most popular items are displayed at the top of your Delve feed. However, what if the Delve and Officegraph technology was used to determined what should be synced to your desktop automatically? I reckon that the stuff you work on most regularly, which will appear in Delve, is typically going to be the stuff you want to sync to your desktop. Wouldn’t be nice if that information could automatically be synced for you? Imagine a world where you don’t continually need to either select what you want to sync or sync everything ‘just in case’. Imagine a world where the algorithm automatically looks at your interactions with files and people determining what should be synced to your desktop. Then, as you interact with things less they stop being synced to be replaced by more current items. What about some sort of slider that you could set to determine the level of currency to sync? If you slide it to the left only the most current information is synced, while if you slide it to the left stuff that maybe less relevant is also synced. However, the bottom line is that Delve watches what you do and only syncs the stuff you use. What do you reckon? Am I onto something here? Love to hear what you think and maybe what else could be included in a Delve desktop client. 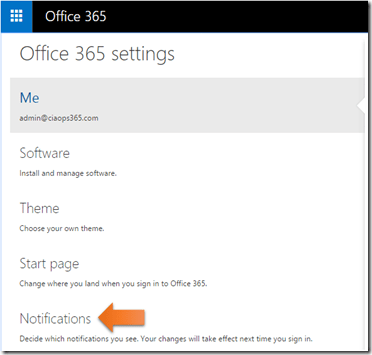 if you want to control the notification you receive when you are in the Office 365 portal here’s how you do it. Firstly, login to your Office 365 portal in a browser. 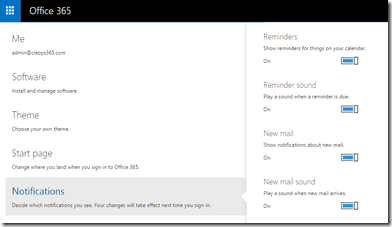 In the top right corner select the COG and then select and the Office 365 settings from the menu that appears. Then select Notification from the menu that appears on the left. Simply switch the notification you don;t want off on the right hand side. Now you can make all those annoying notifications go away so you can be more productive!